Today I got my CT scan in preparation for radiation. 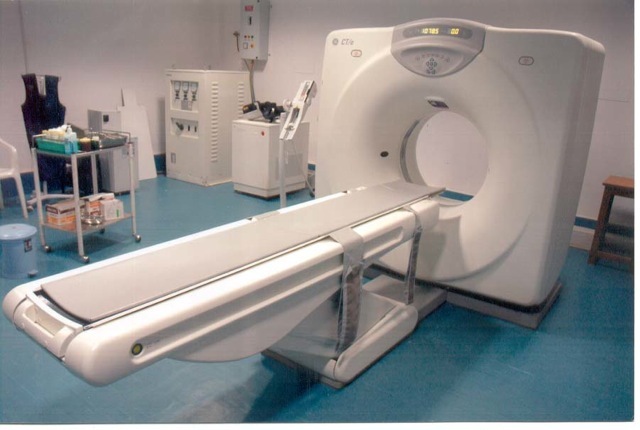 Basically, they do a CT scan to map out where all of the radiation beams (technical term!) should hit. But, before the scan, we met with Dr. Smith. She is Dr. Hermann’s resident for the next three months. We liked her a lot. She was very thorough, spoke in words that I could understand, and it was very clear that she had read my file before she saw me. She knew detailed information about my case. I appreciated that. She told us about what I would experience — fatigue and skin irritation. I’ll get 34 total treatments. So, with Labor Day off, I will officially be done on Sept. 13 — unless my skin gets bad enough that I need a break. .
Dr. Hermann came in to see me, too. Just like last time, he sternly lectured me, then it ended on a positive note. Very confusing. Dr. Hermann’s concern was that if the skin is stretched and tight, I am more likely to have issues in the old infection area. After lecturing me on that, he eventually said it was OK and not a big deal. They will just watch my skin closely during the treatment. While I had Dr. Hermann’s ear, I decided to pick his brain. Dr. Razaq seemed to think I should consider a prophylactic mastectomy on my left side since lobular cancer is more likely to occur on the other side than ductal cancer is. However, MD Anderson, as a hospital, doesn’t recommend “cutting off a healthy breast.” What I tend to hear is that I will be getting screened regularly so there is no need to remove it. Either way, it is my decision. It’s a hard decision, but I really lean toward doing it because I never want to go through chemo again. So, I asked Dr. Hermann what his opinion was. As a reminder, he is well-versed in both hematology/oncology and radiation oncology. He said that with lobular cancer, there is a 25 percent chance that I will have a mirror-image tumor in the other breast. Also, lobular is hard to see, he said. Even with a mammogram. So, if I were going to be screened, it should be with an MRI. That said, he wasn’t sure if insurance would cover an MRI for screening. At this point, I am 98-percent sure I will go forward with the prophylactic mastectomy. I will meet with my breast surgeon at MD Anderson in September. Unless she has an amazingly compelling argument against it, it’s happening. Oh — and I have to throw this in there really quick because it was pretty funny. When the nurse walked us into the room to meet with the doctors, she asked me if I had a list of the medications I was on. I told her that they were supposed to have gotten that list from Dr. Razaq’s office. Her response was that she would call them and ask them to fax the list to her. Keep in mind that not only am I in the same hospital system (you’d think they would have access to my complete electronic health record), but they are in the same building — three floors away from each other. It gets better. She asked what pharmacy I used. I told her the Walgreens we frequent. Her response was …. When we can’t get the doctor’s office to send the list, we can sometimes get Walgreen’s to send it to us. So … you are in the same hospital … in a cancer center … in the same building … three floors away … and you are going to call Walgreens in north Edmond to ask them to send you my medication list? I can’t believe such a nice cancer center doesn’t have their different doctors connected more efficiently. As a comparison, while waiting in the office … on my phone, I was able to go to the MD Anderson portal and read Alan my plastic surgeon’s notes from my previous three visits this year, allowing us to know for sure the amount of saline in my tissue expander. That technology was handy to have, and it helped us clarify what we were confused about. Again, I wasn’t reading a schedule. I was reading the doctor’s actual notes after the appointments. That kind of stuff just isn’t available here. They used what seemed like a bean bag to create a semi-mold of my upper body. I will lay in this each time I go to my radiation to ensure I’m in the EXACT same position each time. This is important because they want the beams to hit me in the exact same places each time. I have three of these masterpieces — one on each of my sides and one at the bottom of my sternum. They covered them with plastic to keep them from washing off in the shower. These will also help them line up the beams quickly each day. Next steps for me — quick surgery on Thursday to remove my port, then I will start radiation on Monday. This entry was posted in Radiation by jenny. Bookmark the permalink. Yay for a happy surgery on Thursday. That is great news! Wow. You are starting quickly. I’ve been led to believe that I will have to wait 1 month to 6 weeks between chemo and radiation. 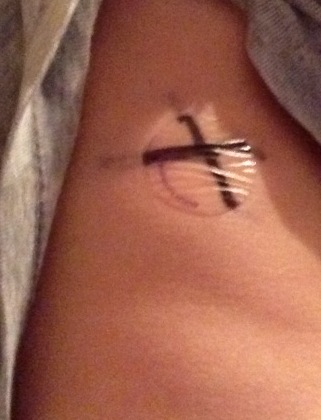 My friend had radiation andmtheymactualluy tattooed the marks onto her! The steroids were so not the big deal,Imthought they were going to be and taxol has been a walk in the park compared to AC. Thank you for your blog. It has helped me prepare. I wanted to tell you that I too was on the fence about double Mastecomy vs. single until my MRI showed a shadow on the “good side”. I decided to have both done because I didn’t want to deal with mammograms every six months and the possibility of more chemo. Turned out they found calcifications in my “good side” and the shadow was a cyst. I was glad to have it gone. It is a personal choice though and a complicated decision. Recovery was much easier on the good side because they didn’t take any lymph nodes. No more port – YAY! No more CHEMO – EVER EVER EVER!! super YAY! Still praying for you every day! Well, it’s the ol’ “right hand doesn’t know what the left hand is doing” problem. Hope you will fly through the radiation and then all of this will be behind you!